"This is amazing, we never thought it is possible to know in advance what is coming into our plant." Rainfall, snow melt, industrial water, inflow & infiltration, and runoff drive variations in wastewater inflow and pollutant loading making it difficult to forecast. With 60% of staff expected to retire, the challenges inherent in influent forecasting will only increase, leading to sub-optimal planning and a heightened risk of permit violation. Variations of influent flow and loading lead to inefficient operations. Aquasight’s ACE provides operators with a two-day forecast of flow and loading. ACE facilitates improved process control planning in both dry and wet weather. ACE-assisted operations allow facilities to meet permit limits and perform maintenance in the most efficient way possible. ACE’s algorithms mine through a complex web of utility-specific historical wastewater flows and regional weather data to forecast today’s and tomorrow’s influent flow. 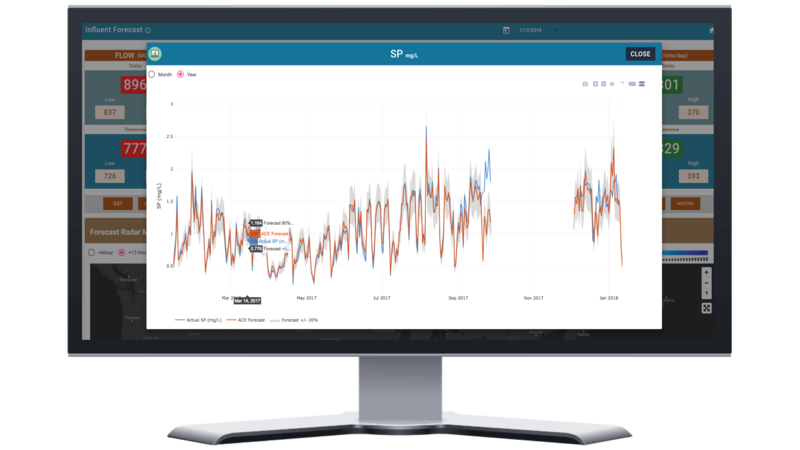 ACE also provides quick access to historical inflow data allowing operators to easily analyze inflow trends over time. Unlike lab measurements that arrive up to 5 days out-of-date, ACE’s instant pollutant forecasts are a viable planning asset. With ACE’s Phosphorus, Ammonia, BOD, and TSS forecasts, facilities will realize improvements in chemical treatment and solids handling. ACE’s built-in radar maps provide a convenient view of the weather forecast in your collection region. 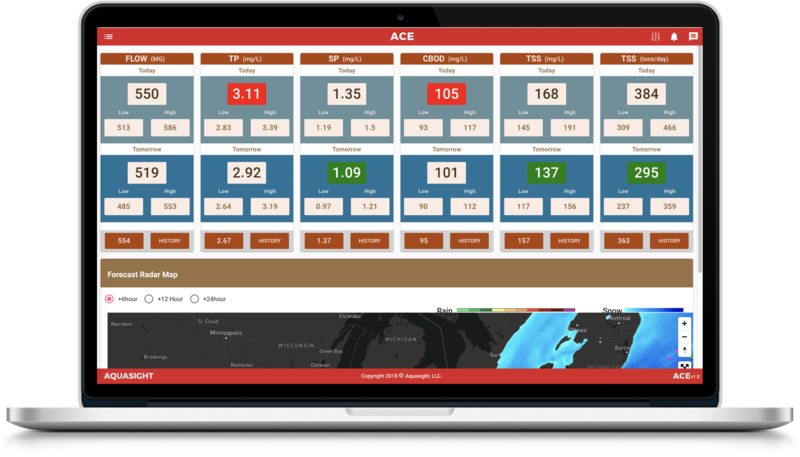 ACE also includes visuals on one-month and one-year time scales of forecasted and measured influent flow and pollutant concentrations providing full forecast transparency and assisting in trend analysis.